I don't know about you but I find making cards for the boys in my family much harder than for the girls. 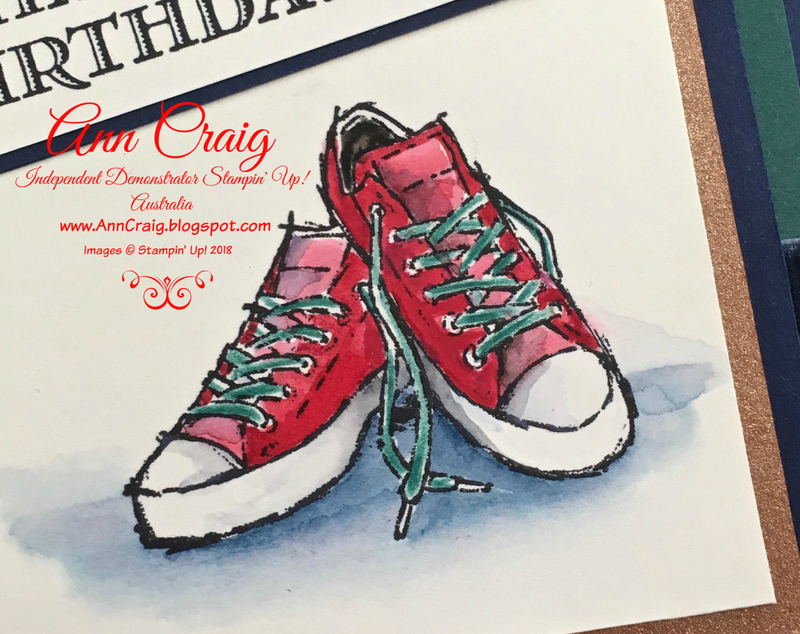 This stamp set from Stampin' Up! - Epic Celebrations - is just perfect for teenagers or even "want to be" teenagers, so it was the obvious choice for my grandson who will turn 10 this week. 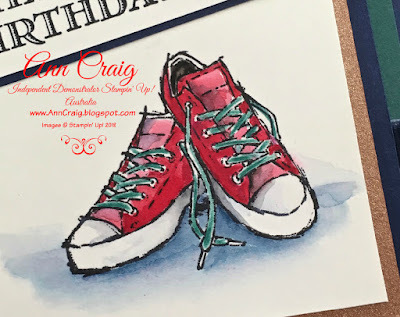 I enjoyed water colouring the sneakers using my Stampin' Up! water color pencils and an Aqua Painter. I have used 2 methods on the shoes. *The first is colouring with the pencil, directly onto the paper and just along one edge of the area to be coloured. Then use a clean Aqua Painter to blend the colour away from the edges and form some contours of the shoe. Add more colour as needed. * the second is using the pencil as a palette. Touch the tip of the Aqua Painter directly onto the colour on the tip of the pencil and paint onto the desired area. The soft pigment in the pencil will transfer to the brush. This method is great for adding more depth to the areas already painted. * Create shadow with a little grey and blue. I combined the stamped image with some of the elements from the True Gentleman Suite. 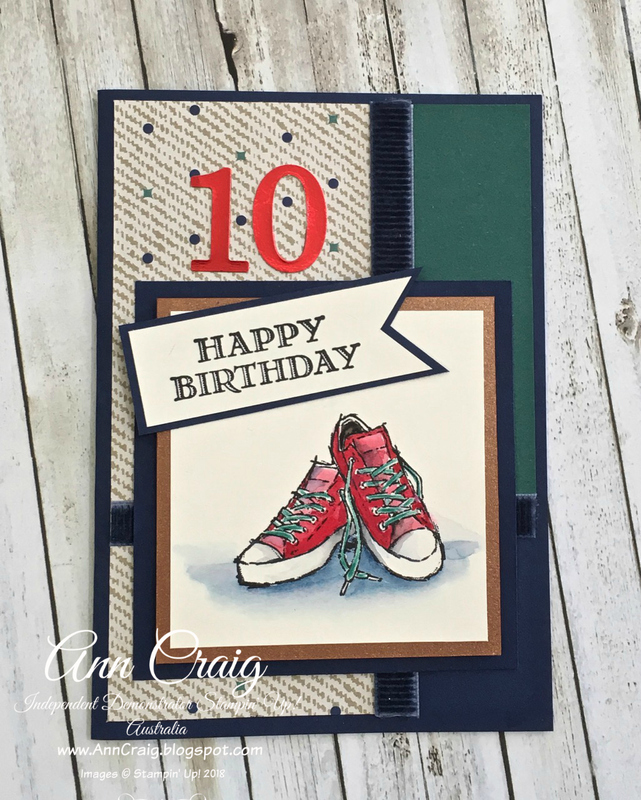 The colours in this suite are really awesome and the accessories like the Night of Navy Corduroy Ribbon, add the finishing touch to the card. The background paper is from the True Gentleman Designer Series Paper pack. This has an abundance of beautiful masculine patterns that help create quick backgrounds for your stamping. And here is another card using some of the other images in Epic Celebrations. Epic Celebrations is a Sale -A-Bration stamp set from Stampin' Up! that you can earn for free, simply by placing a $90+ order. 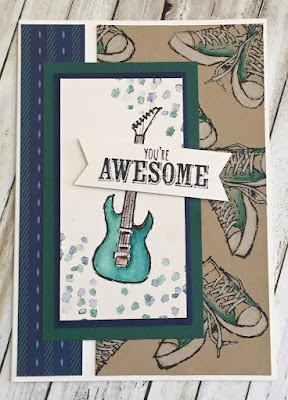 If you would like to own this set you may shop Stampin' Up! products via my On-Line Store, then simply select your choice of Free Sale-A-Bration products to the value earned.